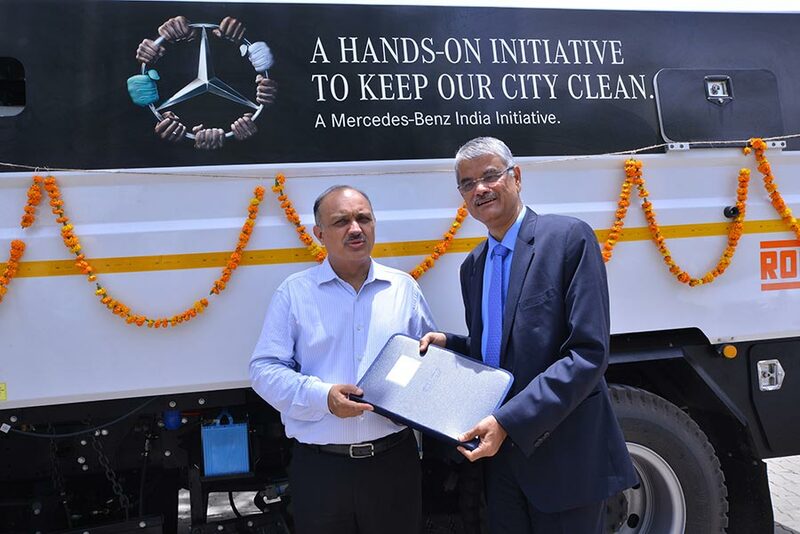 India’s largest luxury car manufacturer Mercedes-Benz today donated a state-of-the-art vacuum cleaning truck to the New Delhi Municipal Council (NDMC) as part of its Corporate Social initiatives. The BharatBenz-based Road Sweeper truck will be effective in reducing dust levels in Delhi by vacuum cleaning the roads. With road dust emerging as one of the key contributors of air pollution in Delhi, the deployment of the Mercedes-Benz donated Road Sweeper truck will assist in making Delhi’s roads and air cleaner than before. 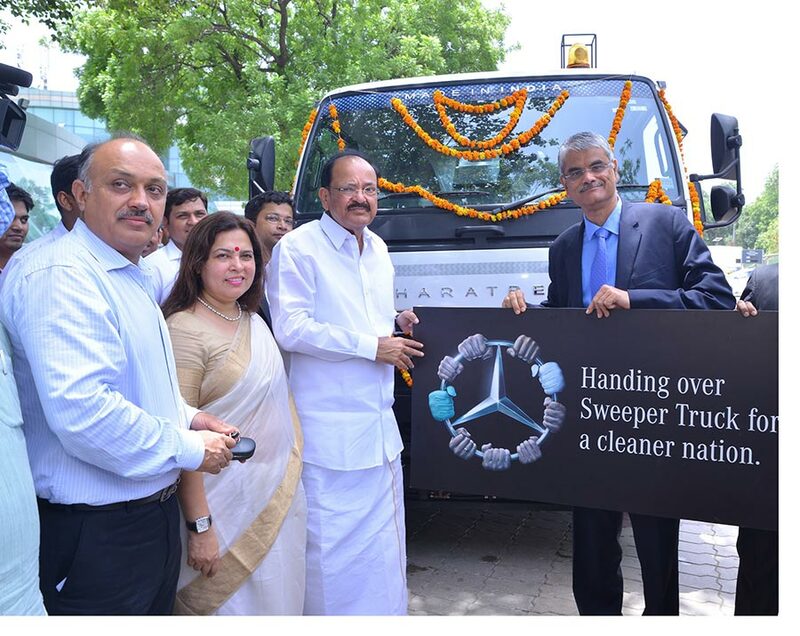 Suhas Kadlaskar, Vice President- Human Resource and Corporate Affairs, Mercedes-Benz India presented this Road Sweeper truck to Shri M. Venkaiah Naidu, Minister for Urban Development, Government of India, in the presence of Shri Naresh Kumar, Chairman, New Delhi Municipal Council (NDMC), in New Delhi today. At Mercedes-Benz, it is our constant endeavour to contribute back to the society, in our own way, under the ‘Mercedes for India’ initiative. Be it contributing to educational cause, rural development, skill enhancement or contributing towards a greener planet, we at Mercedes-Benz sincerely believe in acting for the betterment of the society and the country at large. As a responsible automaker and a corporate citizen, this novel initiative of donating the latest road sweeper truck, is a small step towards helping the citizens of Delhi and the NDMC, to make Delhi roads cleaner. Our endeavour of giving back to the society will continue through varied initiatives in the future as well. Based on a BharatBenz 1214R medium-duty platform, the Road Sweeper truck is manufactured by Roots, India’s largest indigenous manufacturer of cleaning machines and cleaning equipment, and combines maneuverability, efficiency and reliability while offering superior sweeping quality for road and industrial cleaning. Its vacuum cleaning unit is a proven cleaning process that sprays water in the area it is cleaning before the vacuuming head passes the debris/dust, effectively reducing air pollution caused from accumulated road dust. It is the cleanest product in its category in terms of vehicular emissions conforming to BS-IV emission standards with its proven BharatBenz SCR technology solution. Reliable BharatBenz medium-duty truck with low maintenance cost, operator-friendly workplace with air-conditioned cabin. BharatBenz BS-IV solution based on proven SCR technology. Large sized main and side brooms with flexible head, centrifugal suction turbine, water jet for dust suspension, suction ports, hopper dumping. Capacity of the debris hopper: 6 cubic metres / water tank capacity: 1000 litres.